Pimp is Dressed Up for the Florida Gators! Hi Cuteheads! If you didn't already know, I went to the University of Florida (and so did Pimp, kind of!). I got him while I lived in Gainesville, so he's a real Gator kitty! I'm in Gainesville for the game this weekend, so Pimp dressed up for the occasion! 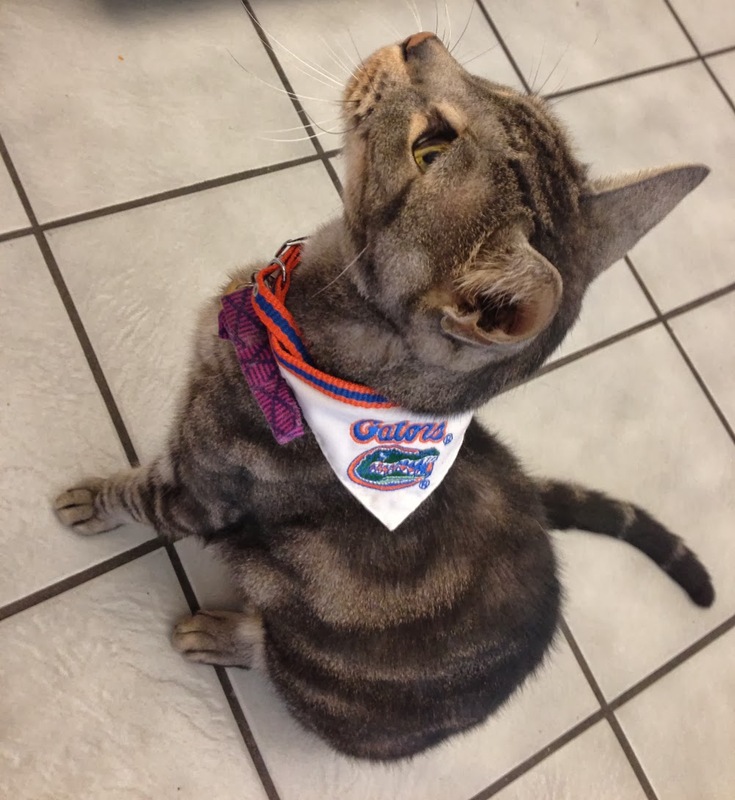 Thanks to Stacey from Good Karma for the cute Gators bandanna she got him! A cute female baby lion tries hard with all her might to roar -- and she is very fierce, of course -- but all the seems to come out is a little bleep. This white baby lion was just born at the Belgrade Zoo in Serbia and this was her first meeting with the media. Her mother's name is Marsha, and I think she's is just the cutest little thing! BONUS CUTE: Here's another baby lion roaring. P.S. Did you know I petted and played with a baby tiger once? It was one of the cutest things I've ever done! Remember the kittens who destroyed their cute house? Well, they're back... and this time they are having an absolute blast in their homemade box fort! It's genius, actually, this little fort. I bet it's hours of fun for these crazy kittens -- and I bet it takes them less than hours to completely kittenize it and tear it down! I would have loved to be this guy! What a sweet moment. For some reason, this crow decided he really trusted this sweet man. He wouldn't leave him alone (and even hopped up on his lap! ), and kept walking back up to him, even after the guy put him down all the way on the other side of the house a couple times. The crow's parents were not too happy about his new friend, it seems. But little crow is really trying to convince them he's made a good friend. I'd have a hard time leaving the little guy after such a sweet showing of trust if it was me! Happy Two Cats Tuesday, Cuteheads! Today Pimp and Moo really wanted to be cute, but they just couldn't muster up the energy to do anything besides snooze. Good thing they look cute even when they're just sleeping! It's an all-out demolition mission! It's amazing what a few kittens can do in just a few minutes. This little kitty house didn't stand a chance! P.S. This is the cutest cat bed/house thing ever! I wonder where they got it? Kids are kids, no matter what the species. And there's no greater and simpler joy than frolicking around in the water. This adorable baby elephant playing in the ocean will put a smile on your face and warm your heart. Just pure happiness! I did a little research after seeing the "Most Happiest Elephant in the World" video making the rounds on Facebook because I wanted to know the story and find the original. This is the original, I think. It was posted back in 2011. The elephant was filmed in Phuket, Thailand. The video says it was before participating in a wedding ceremony, but I don't know if the elephant was part of it or the person. Apparently, it is common to see things like this in some countries! Thanks to Cutehead Jan L. for sharing this video with us!